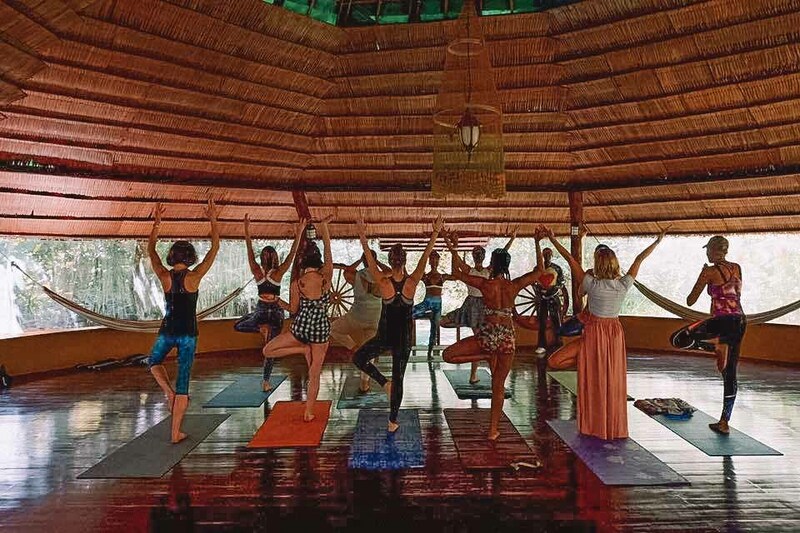 Now that winter is basically here, well it’s definitely here for me in New York, it’s a time for inner self-work and healing. 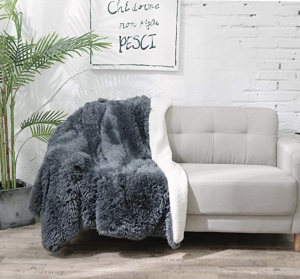 Just by nature, the shorter, colder days invite us to stay inside and get seriously cozy under soft, warm blankets. Even animals know winter is time for hibernation. That being said, now is the perfect time to take nature’s cues to slow down, rest and go inward. Let’s spend time contemplating and gaining clarity within ourselves. Of course we don’t “need” to buy things to make it happen, but hey, it’s always fun to have some tools to help you, right? These are the essentials I use in times of self-reflection and care and have been hitting really hard now that it’s winter. Oh and if you don’t know what you want for Christmas, these are all things you can add to your list! 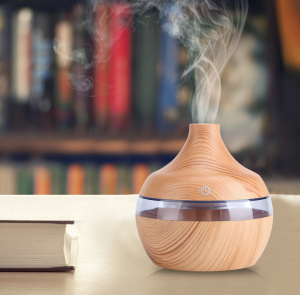 I love running oil diffusers because it not only makes the air feel fresher, but it uses aromatherapy to make the room smell good and raise your vibration. You simply put water and essential oil in a diffuser and it turns it into this beautiful mist. Most diffusers light up and look pretty too. Oils vibrate at high frequencies and using them helps to bring up your energy frequency as well. Every single person and thing is vibrating at a different frequency and the higher it is, the closer it is to “source” or the divine. Raising your frequency helps to give you peace and clarity. My favorite winter oils to use are lavender for relaxing, especially right before and during bed. I also love rose oil and frankincense to help with inner work, love and peace. You don’t have to put the oils in the diffuser either. You can also put a few drops in your hands and inhale the scent and rub it over your body or on your heart. Some essential oils are even edible. One of my favorite things to buy in the winter is a new pair of pajamas. The cozier, the better. Get whatever makes you happy. For me this year, it’s a onesie lined with soft fabrics. I knew I wanted this the second I saw it — it’s also super on sale now. When you put on a soft, warm pair of pajamas, it instantly makes you feel just as cozy inside and ready to burrow under the blankets. Also super ironic that the pjs I happened to pick are from Abercrombie & Fitch, but the AF in the title is really me swearing. Now is the perfect time read any book that makes you rethink how you see things and the patterns or behaviors you may be holding onto from habit. 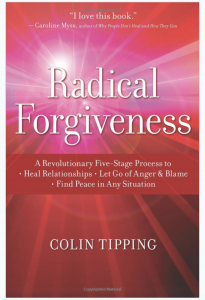 I have so many amazing book recommendations, but for this winter my main focus is on Radical Forgiveness. This book helps to heal any reoccurring issues that keep popping up in your life, whether it has to do with relationships, career or money. 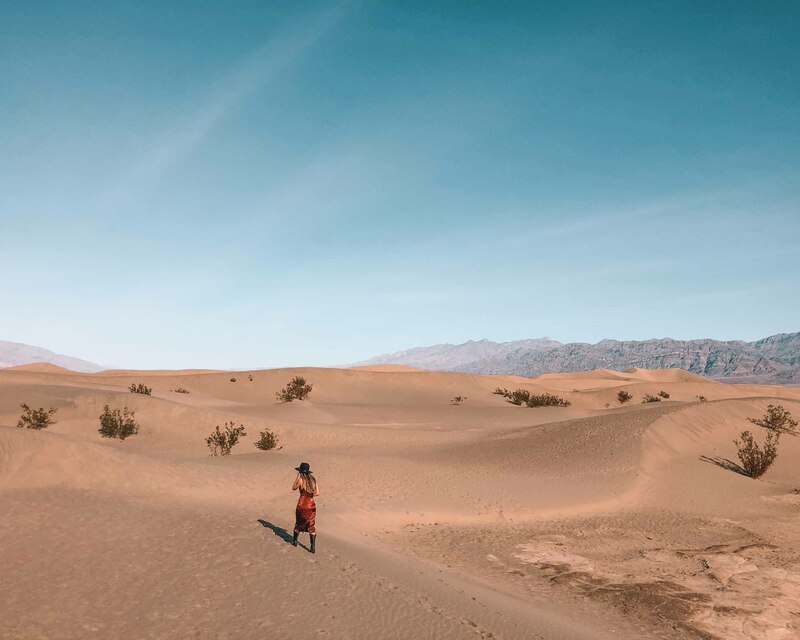 It helps you to reframe your views of current “problems” in your life, trace feelings and beliefs back to childhood and to heal those feelings and the current issues in your life. I can’t recommend this book enough. I’m kind of obsessed and buying it for everyone this year for Christmas. Keeping a journal on hand is one of the best things you can do for your mental health and I’m just starting to really take advantage. When something is bothering you or you’re having ruminating thoughts, it can really help to just write it down and get it out of your head. Sometimes I get upset and can’t even pinpoint why something triggered me or why I’m feeling certain way. When this happens, journaling can help you to get to the bottom of it and uncover those feelings. This is also a great tool to use as you’re reading a self-discovery book, like Radical Forgiveness, to write down any insights you may get. 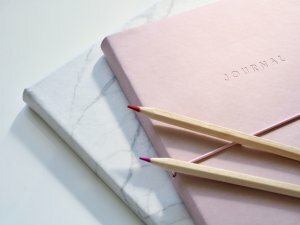 The other amazing use for a journal is to give yourself a daily, morning routine to write out your thoughts, list out your daily priorities and write down a gratitude list. You can also use it to write down any ideas that may pop up in the middle of the day that you don’t want to forget. I even write down my dreams, which helps me to interpret and understand them. No matter what the purpose, keeping a journal with you can help clarify your mind and thoughts and has so many amazing uses. I love finding these gems at a TJMaxx in the home goods section. I also found this cool self-discovery journal on Amazon. Sage is a plant that grows prevalently in California and has been used for hundreds of years as a purifying and protective plant. 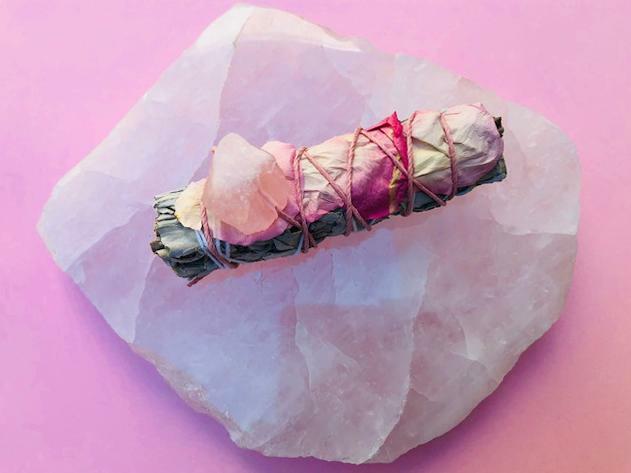 With sage, you can smudge your apartment or room to clear out old, stale, negative energies and refresh your place with fresh, positive energy. You use a lighter or match to burn the end and then go from corner to corner in each room, with the door and window open, giving the negative energy a place to exit from. You can also use sage around your body to clear negative energies, as well as to cleanse any crystals you may have. Actually this whole kit with crystals looks amazing. Baths are one of my favorite daily winter-time rituals. There’s just something about the cold winter air that makes me want to relax in a hot bath every day. And I really do have one almost every day. It’s the perfect time to take a few minutes to yourself with a couple of candles, bubbles and comforting bath salts. Baths salts are cleansing and help draw out impurities from your body. They can also help relax and soothe sore muscles. I love ones infused with essential oils too. 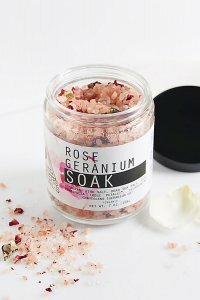 Free People has so many amazing ones, but you can also buy simple Epsom salts from your pharmacy to save money. I love rose quartz because it’s the crystal of love. I like to wear a rose quartz necklace or ring and keep a crystal either under my pillow or around my bed. It helps promote and remind me of the feelings of compassion, peace, and love, whether it’s for myself or others. This is my favorite winter-time crystal because this is the time we’re alone and silent with ourselves and our thoughts a lot and I want to help make sure they’re positive thoughts. It’s also a great crystal to meditate with and put on your heart as you’re laying down and meditating. If you prefer another crystal though, that’s great too. Whatever crystal you see and are most drawn to is the one that you need most at that time. Each one has different healing properties. Check them out at a local store or online and see what you’re drawn to. Then keep it near you, especially as you’re meditating or doing your inner work. Jade rollers are great for a little self-love sesh. I recommend using it as you’re getting ready for bed. 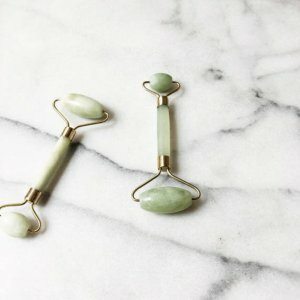 After you’ve cleansed your face and moisturized, a jade roller helps to massage in the product, get your blood flowing and give you glowing skin. It’s also said to help with anti-aging. This kind of goes right alongside the cozy pajamas. A warm, inviting home or cozy corner is essential for winter hibernation, self-love and care. Snuggle up on the couch or on your bed with a warm blanket and some soft, twinkling lights for a lovely environment and spot you won’t want to leave. Now go cozy and curl up with your book or journal. Oh and while I’m at it, I also want to mention this company called Goddess Provisions where you can order a fun, little box that comes with many different healing and spiritual tools. I’ve ordered it a couple of times and it’s never let me down. I’ve gotten things from jade rollers to relaxing tea (oh, another good idea for this list) and aura cleansing sprays. Try it out! 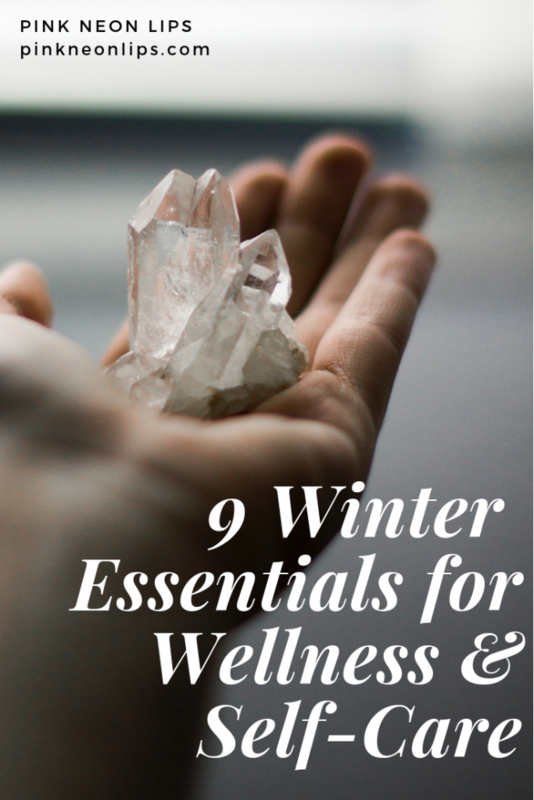 Do you have any other products or tools you use for self-care or self-discovery in the cold, dark winter months? you know, Im kinda skeptical about the powers of crystals but I like what you said about looking at them and remind yourself of compassion, peace, and love, deff. 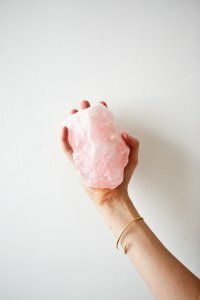 thinking of getting myself a rose quartz crystal.